The memory on my laptop groans under the burden of so many photos of my grandchildren. "Enough!” it screams, "I can’t take anymore!” But I upload new ones anyway. Dozens of them – hundreds of them – thousands of them! These pictures are priceless, of course. And for the longest time I would have declared that they meant more to me than anything. But today something else came along that has completely pushed all those photos aside in terms of value. 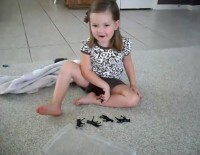 It’s a video of my granddaughter Avery counting to five! Now I’m sure that to some, such an achievement might seem ordinary. After all, doesn’t every child accomplish this, eventually? Yes, perhaps. But you see, Avery has kept us all waiting a very long time for it, and mixed in with all our impatient waiting has admittedly been a fair amount of good old-fashioned anxiety. What on earth was taking her so long? Since both of my own kids pretty much started talking on schedule, I confess that I’ve seldom given much thought as to how, when and why language develops. For instance, I never realized what a layering process it really is, or that all those bedtime stories I read to my babies when they were, well, babies were in fact playing a vital role in imprinting the cadence and rhythm of spoken language on their brains, long before the words had any meaning to them! Of course, Avery’s mommy read to her too, but the poor thing had such an immense volume of fluid in her ears that from birth she heard everything as if she was underwater in a swimming pool! Forget cadence and rhythm – it’s a wonder she picked up any sounds at all! And so the journey began. First there was the surgery to drain those "pipes”; followed by months of regular speech therapy sessions. And let’s not forget the army of friends and relatives who have been offering up prayers on her behalf! But I am thrilled (beyond words!) to report that at last we are being rewarded with the gift everyone has been impatiently waiting for. At the ripe old age of "not quite three” Avery’s words are slowly starting to come! And let me just say, when you have longed for them as much as we have, every single one of those words is like solid gold! Everyone always says, "After all this time of wishing she would talk; before long you will be wishing she would shut up!” That may be true, but at the moment I have a hard time imagining such a thing! From this moment on she will have a means of expressing exactly what she thinks, what she wants, and how she feels. But along with the power of verbal freedom comes the burden of verbal responsibility, and Avery will find out soon enough that just as there is nothing sweeter than saying something nice, there is also nothing more bitter than saying something you wish you hadn’t. But she’ll have plenty of opportunities to discover those things later. Right now it’s time to celebrate this new mini-explosion in her heretofore non-existent vocabulary. I could sit here all day and watch that video of her counting those five little horses. Yes I still love my collection of photos, but they pale in comparison to the joy of listening to Avery speak. I guess it really is true what they say – a word is worth a thousand pictures! Search for Grandchildren articles similar to "The Word According to Avery. Search all articles similar to "The Word According to Avery".